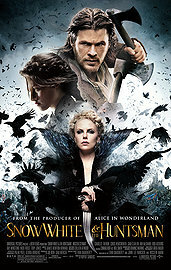 In the epic action-adventure Snow White and the Huntsman, Kristen Stewart plays the only person in the land fairer than the evil queen (Charlize Theron) out to destroy her. But what the wicked ruler never imagined is that the young woman threatening her reign has been training in the art of war with a huntsman (Chris Hemsworth) dispatched to kill her. Sam Claflin joins the cast as the prince long enchanted by Snow White’s beauty and power. This movie was set in medieval time giving me the impressions that I am watching something in between Lord of the Rings and Games of Thrones. With that in mind, Snow White and the Huntsman failed miserably below par. Incoherent accents, poor acting performance and bad writings basically summed up the movie. The movie basically rewrite the story ending with the huntsman’s kiss awoken Snow White as the possible opening for second installment. I am pretty confident that I will not be paying money to watch the second movie if they decided to make it. I don’t know the reason why fairy tale especially Snow White are so popular right now. “Mirror Mirror” was another movie released earlier this year with the exact theme and “Once Upon a Time” series on ABC was the other show which has Snow White theme. I actually enjoy the TV series more than this movie. “Mirror Mirror” served its purpose to be a comedy movie. I guess I had higher expectation from this movie. Overall CGI was good with an impressive troll scene. This movie has the worst and weakest war speech I had ever heard. With that speech, I would rather suffer under the evil queen rule than fight along with Snow White. I was expecting a war speech similar to the one given by Theon Greyjoy in the season two finale of Game of Thrones before he got knocked out by his underlings. That speech can definitely riled up the troops. Charlize Theron seemed to be shouting every time she spoke and she didn’t portrayed the evilness believable for me personally. I would rate Chris Hemsworth the worst narrator of all times. This has been a disappointing summer so far.